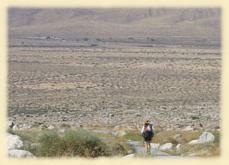 Hiking in the deserts and arid regions can be exciting and challenging. Tons of different animals, plants, and scenery can be enjoyed when you hike someplace other than the mountains. The Grand Canyon is one of the most popular U.S. arid locations, but all over Arizona, New Mexico, and other southwest states, you can find great hikes to test your skills. Most importantly, remember that hiking is supposed to be fun and you are responsible for your own safety. Before you start on your hike, check the weather forecast. If it is expected to be 110 degrees and 110% humidity, then you'd better seriously consider postponing the day hike until things cool down. Your physical shape and hiking experience should also be considered. Hot weather means more strain on hearts and lungs and lots more perspiration just to keep from burning up. Make sure you are comfortable with everyone in your group being out in the heat. Pick a less strenuous route. Maybe cut back on the number of miles you plan to cover and choose something that is flatter than you'd normally tackle. Plan a route that is in forested land, that follows a stream, or has stream crossings. The extra shade and access to water will give you shelter if it gets too hot. If you have a choice between hiking in the valley or in local mountains, spend the day hiking the mountains. 4,000 feet up will be noticeably cooler than down on the valley floor. Include Gatorade mix or some other electrolyte powder. Mix it about half strength in your water to replenish what you sweat out. Include some salty snacks for the trail. Take more frequent breaks and ensure that everyone is drinking water. Enjoy the water. If there is a stream on your route, wade in it to cool off. Use a soaked bandanna to cool your head and neck as you hike, too. Be extra vigilant about blisters. The heat and extra sweating may help you experience your first blister in a long time so notice and treat hot spots. Cotton T-shirts will soak up your sweat and hold it, making the shirt heavy and reducing the cooling effect of the sweat. Wear a polyester t-shirt instead to wick the sweat away quickly. Also, make sure the clothes you are wearing are loose-fitting for more air flow and less chafing. 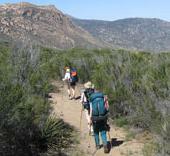 If you are new to desert hiking, you need to learn a new set of skills and guidelines. It's similar to alpine hiking, but does have some important twists. Be prepared before you head out and you'll have a great time. Pick a time of year when temperatures are less extreme. If you really want to battle 120+ degree heat in the middle of summer, then go ahead, but I won't be seeing you out there. Consider spring or fall hiking instead. Carry all your water with you. Don't plan on finding any water on your hike - even a spring marked on your map has a good chance of being dried up. Carry at least a gallon of water per person. Watch for distant storms. Rain can fall miles away in the mountains and create a flashflood roaring down a bone-dry gully. Thunderclouds over mountains on the horizon may mean water coming your way, so stay out of dried waterways. Carry DEET-based insect repellent to fight off insects. The sun can fry you. Just as there is no protection on high mountains, there is little shade in the desert. 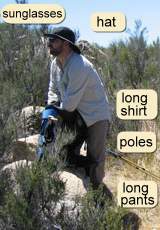 Wear light, loose, long-sleeved shirts, long nylon pants, wide-brimmed hat, sunglasses, and sunscreen. Re-apply sunscreen occasionally if you're sweating or wiping it off. Add a multi-purpose tool to your pack. A small pliers will be useful for extracting cactus needles. Watch out for dangerous plants. Cactus and other irritating plants just need to be touched to ruin your day. Brushing your calf against a cactus while wearing short pants can easily take an hour out of your hike and possibly ruin the whole thing. Watch out for dangerous critters. Arid regions have more venomous and poisonous critters than cooler areas. Snakes and reptiles are in the sun to warm up when it's cool and in the shade to stay cool when it's hot. Never put your hand where you can not see, like in a hole or under a rock. Always check around the area before you rest or sit down. Keep your ears open for a rattlesnake's warning. There are three stages of heat-related illness that your body may experience - dehydration, heat exhaustion, and heat stroke. It's crucially important that symptoms are recognized and actions taken immediately to prevent escalation of the illness. The good thing is that it's very simple to prevent all these problems. Breathing - water evaporates in the air you exhale with every breath. Depending on how heavily you are breathing, how dry the air is, and air temperature, you can lose from one to six liters each day. Normally, it's around one but strenuous activities like hiking increase it. Sweating - through normal daily activity, you lose one to two liters through minimal perspiration. But, hotter and drier air along with increased physical exercise can push that up to one liter per hour! A consistent, non-exhaustive hiking pace will help here. Using the bathroom - urinating is the body's way of clearing out waste from the blood. Losing one to two liters of fluid a day from urinating is good. If you are going less than that while out hiking, you probably need to be drinking more. If you are sick and having diarrhea, then you may lose significant fluid that way also. Eating well and staying healthy on the trail is important. When you exert your muscles, they generate heat which is absorbed by your blood and warms your body core. When the temperature gets high enough, your body's thermostat clicks on and the cooling system turns on. Blood flow increases to the skin where the blood can better cool off - this is why you get red. Sweat glands produce liquid which evaporates to increase the cooling rate. Everything works fine as long as there is sweat and it can evaporate. If you run out of liquid to create sweat, bad things happen. Kind of like an air conditioner that had all the coolant leak out - it doesn't cool. You need to keep the liquid reservoirs full in order to keep your body cool. On cool days, like 65 degrees, your body's 95 or so degree temperature is 30 degrees higher than the air so heat is transferred to the air through radiation. But, when the air temperature reaches 95 degrees or higher, your body no longer radiates heat and instead may absorb heat. Radiation is how your body loses about 65% of its heat so this is a big hit to the system when air temperature reaches 95. Evaporation of sweat normally accounts for around 30% of your body's heat loss. But, once the air temperature is over 95, it's the only way to get rid of excess heat. On a hot dry day in the desert, your body will sweat a lot and the evaporation will keep you cool. But, as the air humidity climbs, less and less water can be absorbed by the air until 100% humidity is reached and your body can no longer dissipate heat. If you continue to generate heat with no way to get rid of it, bad things happen. Stay well hydrated. Drink lots of water. Drink every 10 or 15 minutes, more often as the temperature climbs. Wear clothes made of light fabric and light colors to effectively shade you from the sun. Include a wide-brimmed hat and neck shield. Include some Gatorade type mix in some of your water to replenish lost minerals. Hike with a buddy so you can keep an eye on each other. Slow down, rest more, stop if tired. Don't push yourself on hotter days. Hike in the cool part of the day. Hiking in the Grand Canyon between 10am and 5pm during the summer, for example, can be deadly. Usually, when your body needs water, you get a signal in your little brain that says "Hey, I'm thirsty!" and then you get a drink of water. Unfortunately, by the time you get the signal, you are often already on your way to being dehydrated - and sometimes you may not even get the signal if you are losing fluid rapidly and the sensors get overwhelmed. Symptoms - Dehydration symptoms include reduction in coordination, fatigue, and impaired judgment. Treatment - Rest in cool, shady area. Replenish liquids. Drink cool water. Your sweat is mostly water but also contains electrolytes - sodium and chloride ions. When you sweat and do not replenish those electrolytes, heat exhaustion occurs. Even if you consume water, you may experience heat exhaustion if you are sweating heavily for prolonged times. Symptoms - Heat exhaustion symptoms include fatigue, nausea, lightheadedness, fainting, headache, muscle cramps, irritability, and exhaustion. There may be heavy sweating if liquids have been consumed. The symptoms usually occur after the exertion which caused it, even after water has been taken to improve the dehydration. Treatment - Heat exhaustion is not life-threatening and goes away with enough rest and water, but can escalate to heat stroke if not quickly addressed. The condition can be treated more quickly by consuming electrolyte solutions such as power drinks or a teaspoon of sodium chloride salt dissolved in a liter of cold water. Drink the water slowly over 30 minutes or more while resting in a cool, shady location. Pour water on the person to help cool him off. Have him sit in a stream if it is not too cold. Heat exhaustion can quickly become heat stroke if not treated immediately. Heat stroke can kill quickly - less than 30 minutes. This is an emergency situation and 9-1-1 should be called if possible. When your body can no longer dissipate heat, it overheats which can destroy internal organs, including your brain. Symptoms - Heat stroke symptoms include red, hot skin because all the surface blood vessels are dilated. It is possible to have heat stroke with wet skin, especially on hot, humid days, but when caused from extended dehydration, there is usually little sweat present. When the brain begins to overheat, it affects behaviors and the victim may become disoriented, irritable and combative, and have hallucinations. The victim will finally collapse and die if not treated. Treatment - Cooling down the victim quickly is the first goal. Cooling the head and neck should be top priority. Rest in a cool, shady place. Remove clothing, spray water over body, apply wet bandannas, fan the victim to promote evaporation, drinking cool water if possible. Getting a heat stroke victim to drink may not be possible, depending on their mental state. Any heat stroke victim needs to go to the hospital as soon as possible. Your suggestion "Cotton T-shirts will soak up your sweat and hold it, making the shirt heavy and reducing the cooling effect of the sweat" is way off base. You are wrong. Cotton allows for better cooling through evaporation. You do not want to wick moisture away in the desert. You want evaporation to take place. Get your cotton shirt wet and enjoy the cooling effect of evaporation! Wicking synthetics is a no no for true desert rats. Leroy is wrong - the old adage of "Warm When Wet" for wool still stands strong - wool will easily kill you if you aren't careful.